At Christmas, it’s lovely to wrap up in gloves and scarves and mittens to guard against the cold. I love to go outside and watch my breath mist in the sharp air, and inhale the cold crystal clarity of the season deep into my lungs. But when it’s damp and chilly and everything’s a bit sodden, it can be miserable. Cosy knits definitely help with this, and I knitted myself a pair of hand warmers to ward off the chill. I’m sure we’ve all had days where we feel like an extra layer, even inside, and my classroom at school seems to oscillate between sultry oven and industrial freezer with no happy medium. 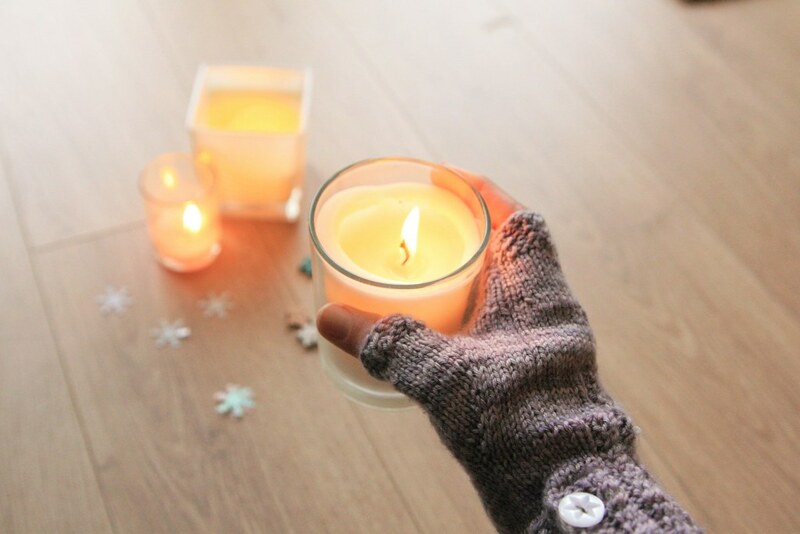 Hand warmers are great for indoors as you don’t lose any dexterity. Actually, they are also great for outdoors if, like me, you like a haul a camera with you everywhere you go and you want to be able to push the buttons and twiddle all of the things without removing your gloves. Of course fingerless gloves will serve the same purpose, but I tried knitting those before and it didn’t go well because a) the fingers were fiddly and annoying, b) the first one came out far too small, and rather than keeping my hands warm, simply restricted circulation to my fingers, which was the complete opposite of the desired result. I couldn’t face the prospect of knitting two more (a replacement, and then the other hand, which would require ten more fingers overall) and so I gave up in a huff. This was nine years ago and I’m totally over it and can laugh about it now. Mirthlessly. Anyway, it’s lovely and indulgent to curl my fingers into the warmth of wool, especially if there’s a bit of cashmere in there as well, and I cannot get enough of this yarn from indie Australian company Skein. Which is unfortunate because I have very little left and am therefore considering keeping the little ball that remains as a pet. A soft snuggly pet that never needs feeding or walking and never makes any mess, but will quite contentedly sit and watch Gilmore Girls with me while I craft. The colours are wonderful, drifting in and out of muted violet and soft grey shades, and I learned a new mini-cabling technique while knitting these up. The pattern is called Pride and Prejudice Mittens by designer Christelle Nihoul, and you can find it here on Ravelry. I'll be honest: I was kind of sold on the name alone, but I think they have a real sense of delicate elegance that feels very regency. The textured pattern is used effectively without swamping the whole mitten, and I think it's very pretty. I haven’t knitted huge numbers of mittens before – exactly no pairs, to be precise – and so I think I would have benefitted from proper instructions for right and left gloves. They need to be symmetrical, not a matching pair, and so my thumb gusset was a little misplaced on one of them as the pattern only had full instructions for one hand. The second hand being left as an exercise for the interested knitter. Not to worry though, and I would actually knit them again as I love the design. Any with yarn this pretty and luxuriously soft, I’m going to have warm little fingers this Christmas.